The Counter Affect: Why you shouldn't take that counter offer. - Construction Recruiters, Inc. The Counter Affect: Why you shouldn’t take that counter offer. Posted June 2nd, 2015 filed under Candidates, Interviews, Negotiating, Recruiting. Share the post "The Counter Affect: Why you shouldn’t take that counter offer." Accepting a counter offer rarely has a happy ending. “If you send a signal that you’re unhappy, and if your boss personalizes your desire to leave, then staying doesn’t make sense no matter what they offer you,” says Arlene Hirsch, a Chicago career consultant. “Your motives will be suspect from that point on,” she says. Not only may your boss feel slighted, your team will, too. MarketingProfs highlighted a career management report was based on data from 400 telephone interviews: 200 with US marketing executives randomly selected from companies with 100 or more employees, and 200 with US advertising executives randomly selected from agencies with 20 or more employees. 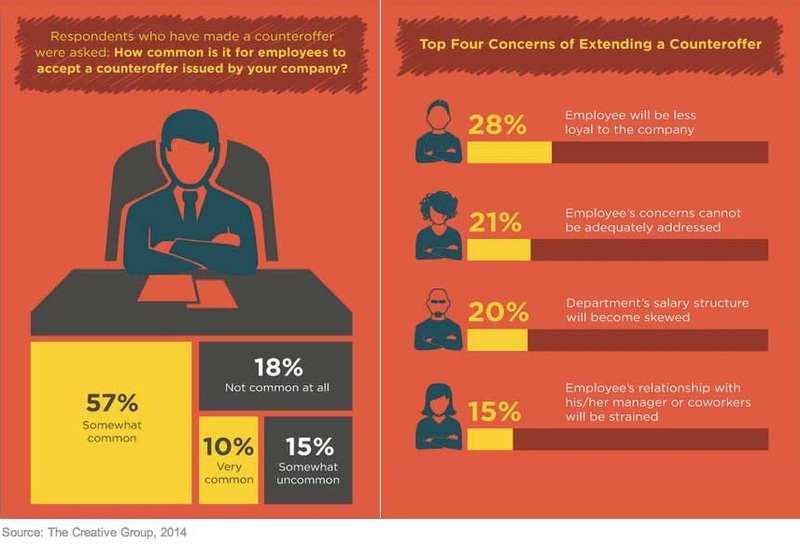 More than 50% of all employees who accept counteroffers change companies within the following 24 months. A staggering 80% say that relationships with co-workers deteriorate and productivity falls among employees who agree to stay. 70% add that counteroffers are perceived by employees as a short-term cure for a long-term problem. 60% of the managers and recruiters questioned say they would never personally accept a counteroffer. Yet, 90% acknowledge having made counteroffers on behalf of their companies. By the time you’ve engaged in a job search (especially to the point of receiving an offer), you’ve already considered the pros and cons of remaining with your current employer. There is a reason or set of reasons that you want to leave. If you felt you were underpaid, you’d have asked your boss for a raise. Also, a counter offer does not mean that your value is recognized. It is easier to make a counter offer than to replace you. – Counter offers are purely a response to you leaving. – Your loyalty will always be in question. – When times get tough, your employer will begin the cutbacks with you. – It’s unlikely that anything that was frustrating you about your role will change. – Your company will immediately start looking for a new person at a cheaper price.